The single-volume international English dictionary with the widest coverage of all the riches of the English language. Clear, accurate and occasionally witty definitions, with the latest new words from science, technology and contemporary culture. This 13th Edition reflects the changes in our language, with special attention paid to new words that have emerged. The 13th Edition includes over 290,000 distinct words, compounds, phrases and derived forms. 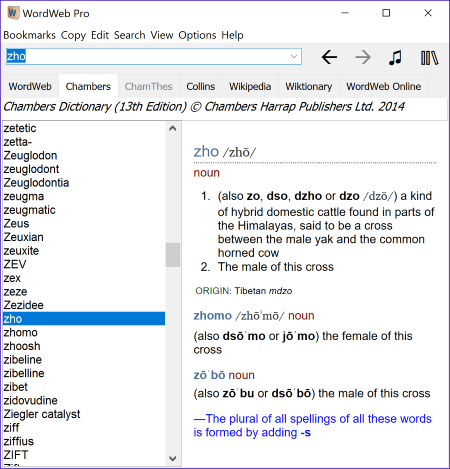 The dictionary comes with the corresponding word list that you can use for word finding or with Crossword Compiler. The Chambers Dictionary download size is about 18MB, and does not include audio pronunciations. 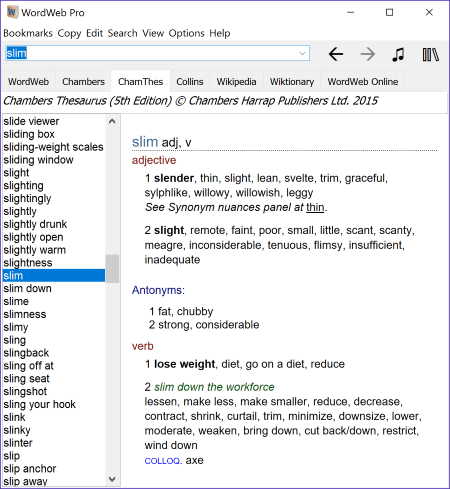 A comprehensive thesaurus with nearly 40 000 distinct indexed words. The Chambers Thesaurus is a veritable treasure-trove, with the greatest selection of alternative words and phrases available in an A to Z format. Modern vocabulary sits alongside archaic, and technical terms, formal language and slang are all covered.